We have given Gallente highsec a lot of love and attention over the last several weeks. Now it's time to move on and spread the wealth. Originally I was leaning toward going to Amarr highsec, but then I thought, nah, forget it, let's go hit the most populated mining area of the game: Caldari highsec. It's a heavily-modified Dotlan map, cutting across The Citadel, Lonetrek, and The Forge. 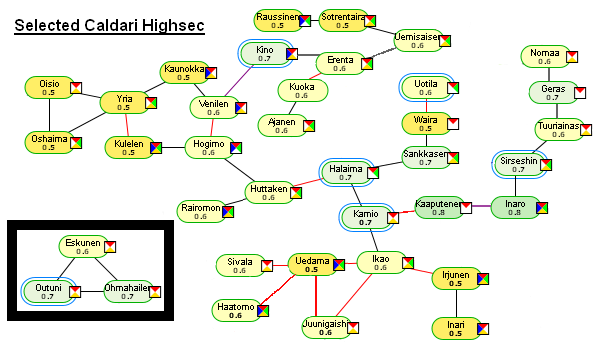 Kamio and Halaima are in the center, of course, and you've got Uotila, Sirseshin, and Kino nearby. You'll notice the little island in the lower-left of the map. Outuni is somewhat isolated from the rest of the systems, but is actually about a half-dozen jumps away from Halaima (easily crossed during part of an aggression timer); it's just not easy to represent on the map without cluttering things. Unlike the other ice field systems, Outuni is not surrounded by other good target systems; it's included simply because it's such a highly-populated mining system itself. After thinning the ranks of miners in Gallente highsec for so long, and having reduced so many mining centers to rubble, some New Order Agents may be shocked to see so many systems with so many miners in them. Enjoy! Using the magic of New Order Logistics and corporate bookmarks, I have created insta-undocks and insta-redocks for a station in each of the six ice field systems, along with tacticals for the ice fields. Suppliers, it's your job to figure out which of the systems you want to stock with Catalysts and equipment. Outuni is off on its own, so it would need its own staging area. Halaima might serve for hitting Kamio and Uotila. Alternatively, Halaima and Kamio could both be stocked (since there's a chokepoint between them that can be easily camped), and Kamio could be used to hit Sirseshin. Kino is a logical staging point as well. It may be that we start in a couple systems and gradually spread our supplies out, as we did in Gallente highsec. As before, our Knights will move along with our supplies. Miners of Kino! At last, at long last, I am coming for you. The New Order is like the cuddly toy on the conveyor belt. Halaima I'm coming for you! Fear not, salvation from bots is near. I was happily retired. I was planning on relaxing in Brapelille and spending my sunset years learning tanking skills. Maybe enjoy some pod-scouting, provide warp-ins for those crazy New Order kids. Now this? You had me at Caldari! I was in Halaima last night, the ice belt was infested with Mackinaws and an Obelisk! !, now that's a killmail just waiting to happen. The relocation has begun. Caldari space, the liberation is underway. Yay! Caldari space is my home! I spent some time yesterday bumping bots, AFKers and non-compliants in Kino last night. Although I was happily surprised by the numerous people who took our Code to the heart and paid the Mining Permit, there was much work to be done. I look forward to seeing my Code brothers in the fields. Im very excited about gaining new NO brethren in Caldari space! Cant wait for the new success blogs and forum posts! Be sure to us when you arrive. Bobbins you're one of the most assiduous Miner Bumping readers...you just HAVE to comment every post, even if you don't have anything to say! What can I say this AFK mining frees up so much time! Anyway I thought the Car 54 reference was quite apt bungling cops = New Order. Also they have meant to invaded Caldari space so where the hell are they? About the PS: you're honest, I appreciate that. Just shake off that AFK thing and you could be a worthy member of the New Order family. Not only is Bobbins a religious reader of MinerBumping, he's also a bit of an obsessive New Order groupie. New order its not going to work!!! Nothing has worked and never ever work what ever you down low clowns trying to do!!! All of Caldari highsec is waiting for you to kick your big fat asses!!!!!!!!!!!!!!!!!!!!!!!!!!!!!!!!!!!!!! i always do like an empty threat from a guy named "anonymous"
I am all for you guys taking out gluttons and bots. If a director can contact me in game @Shootinjoo Saissore I would greatly appreciate it.